Patrons must enter the Park and View areas via the designated Park and View Access Gate which is located south of the main entrance; turn right once you come off the highway. The Accreditation Centre is located at the main Ticketek box office, at Gate 3. 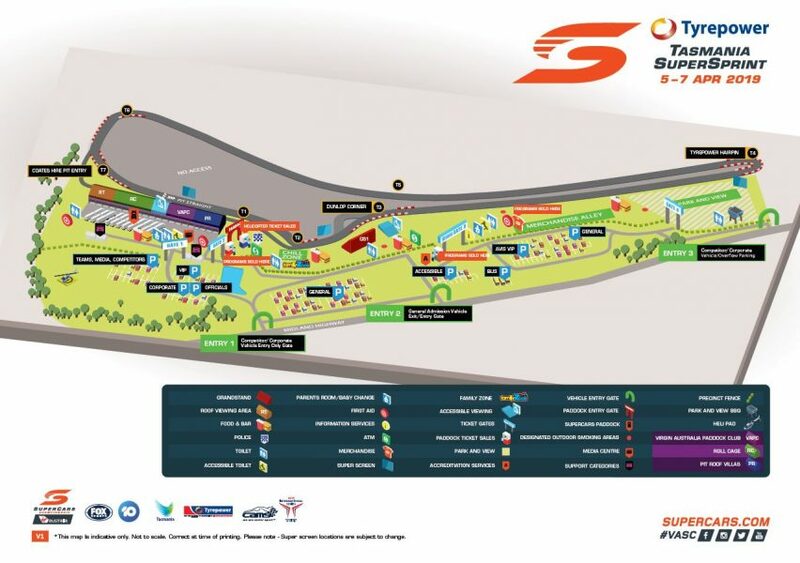 Patrons in possession of a 2019 Supercars Membership card will be entitled to enter the track 30 minutes prior to the general public at Gate 3. Symmons Plains Raceway is located on Midlands Highway, 10 minutes south of Perth, 25 minutes south of Launceston, an hour from Devonport and two hours north of Hobart. Parking is also available free of charge at the circuit (subject to capacity). Follow directional signage off the Midland Highway to the General Admission Car Park, located inside Gate 2. Fans also have the opportunity to park their cars trackside with a Park and View upgrade ticket. Disability parking is available in both the General Admission and Corporate car parks. Please display your disability parking permit. Hire your car from Avis while in Tasmania, and you'll be in Pole Position with VIP parking at the Tyrepower Tasmania SuperSprint. Taxi’s Combined will be servicing the event, make a booking on 131 008. The best place to meet the taxi is at the Main Gate. There is a dedicated viewing platform which is attended by event officials throughout the event. It allows access to those patrons with a disability and one companion. The disabled platform is at the base of the Pedestrian bridge located on the outside of the track on Pit Straight. There are wheelchair friendly toilets in the precinct located in the Merchandise Area. There are no track crossings at this event. Companion Cards are accepted at this event for general admission tickets and access to the wheelchair accessible platforms. If a companion card ticket is required, then the companion card must be presented at the time of booking and also carried with the disabled person when attending the event. To book companion card tickets please call 132 849 or visit any Ticketek outlet. Alcoholic beverages are available for sale from the numerous bars and licensed outlets located throughout the venue. Bars will operate from 10am daily. Corporate Bars will open at 11am daily. Liquor licensing laws prevent patrons from bringing their own alcohol into the venue. No glass is permitted. There are baby changing facilities at the: Paddock and Near Merchandise Alley adjacent to the main entrance. A parent’s room is also available for your use at the toilet facilities adjacent to the main entrance. There will be first aid facilities located around the circuit at the following locations and will also be conducting roaming patrol. Refer to Track Map for locations. There are a number of food outlets to choose from located around the event precinct. Patrons may bring in limited quantities of food and drink for personal consumption. No alcohol or glass is permitted to be brought into the precinct. An information Booth will be located inside Gate 3 (Main Gate) for all your enquiries regarding the Tyrepower Tasmania SuperSprint. Police Service will be established within the vicinity of Paddock Entry Gate and will be conducting roaming patrols throughout the days of the event. The Official Program will be available at the Official Supercars Program store, Ticketek Box Offices and the Paddock Box Office for $10 each. Promoting and funding world-leading, innovative research into prostate cancer. Implementing awareness and advocacy campaigns and education programs for the Australian community, health professionals and Government.